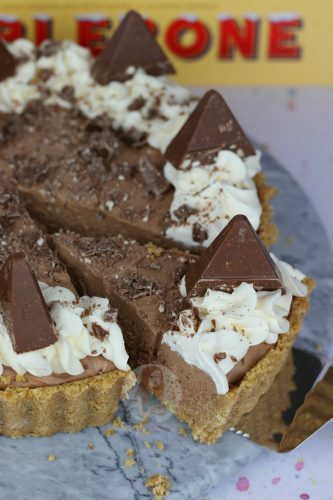 An Easy, Delicious, Showstopping Tart with a No-Bake Biscuit Crust, and a Three Ingredient Toblerone Mousse Filling. 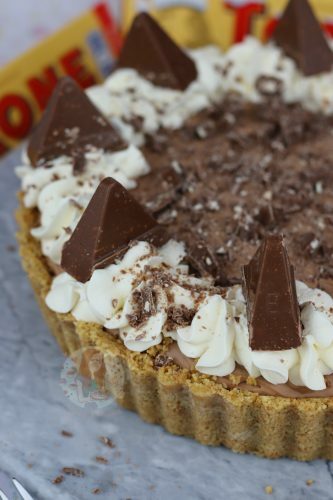 Delightful No-Bake Toblerone Tart! So, after the downright and continued success of my No-Bake Terry’s Chocolate Orange Tart, I thought I would do another. I will admit that you can do pretty much whatever flavour you want of one of these, but I know some people occasionally need a bit of inspiration… so I did another favourite chocolate bar of mine; Toblerone. I just simply adore being able to do something so simple, but it be such a massive hit for everyone. A simple biscuit crust (I use digestives, but you can use pretty much whatever biscuit you like) with butter, just like a cheesecake crust, is perfect for this. 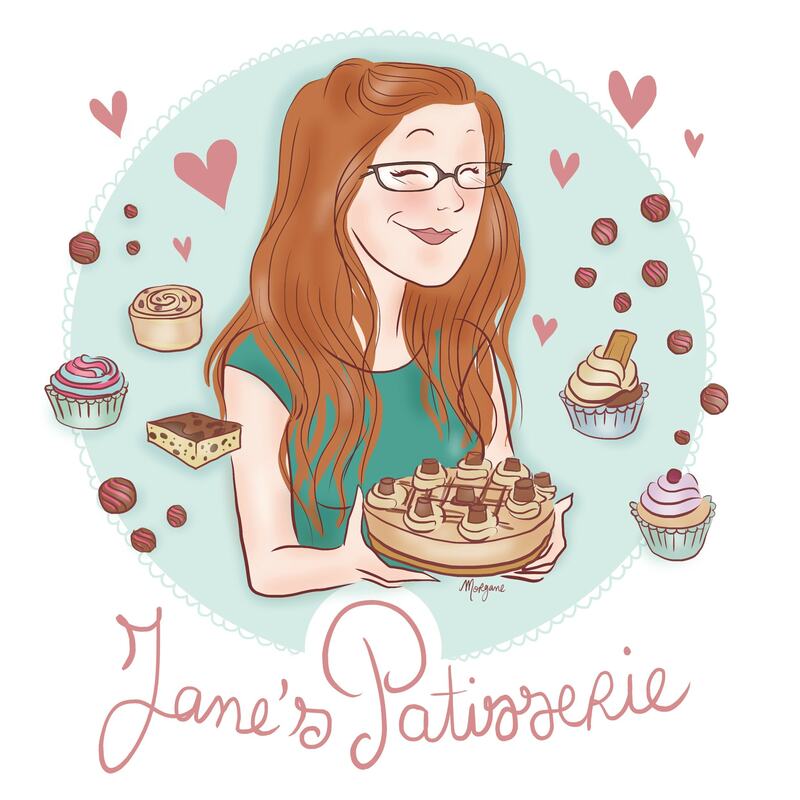 You can easily use a pastry crust such as in my Salted Caramel Chocolate Tart, but I really do want recipes to be simple sometimes. Just like my No-Bake Terry’s Chocolate Orange Tart, I went for the simplest filling I could… which has three ingredients. 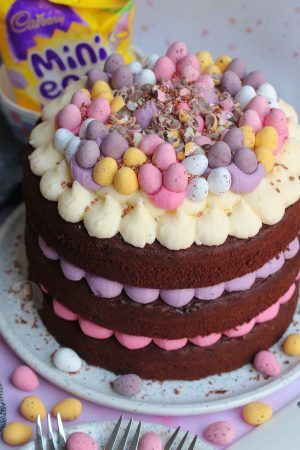 To be honest, you could probably get away with not using the icing sugar in the filling, but I then it helps whip the cream to a better texture, and then also keeping it more stable. You could use a little less if you wanted, but I think 75g is the perfect amount. Toblerone is naturally thinner then most chocolates once is melted because of the other ingredients that are in it, but its not a bad thing. 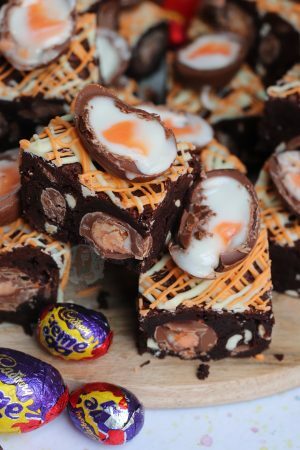 You can’t completely avoid lumps in this recipe because of the little pieces of nougat in the actual Toblerone, but I love them. It literally just becomes a Mousse version of a Toblerone. You could easily just use a milk chocolate if you wanted, and add in pieces of nougat (but I just don’t think it will taste the same), or you can use one of the many other Toblerones the are now available such as the Dark, White, Fruit and Nut etc! Maybe not the massive 4.5kg one they had for sale over Christmas though… (£50-£60 for a tolerance is a bit steep, even for me). If you wanted to try this out in a different flavour, you really can! You could use Cadburys Fruit and nut, Cadburys plain chocolate, or Galaxy, or Galaxy Cookie Crumble etc! The only thing I wouldn’t recommend is using a filled chocolate such as one with a caramel in, as the will behave different. Also, often ones with a filling don’t melt in the same way either. However, if you have a go and they work, I’d be intrigued to know how you get on! 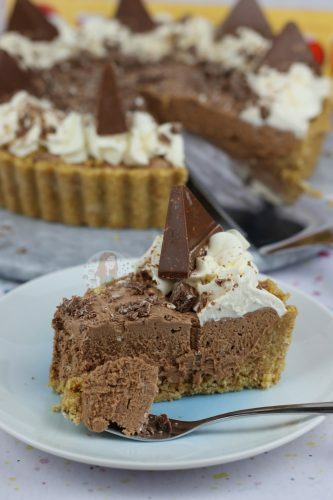 An Easy, Delicious, Showstopping Tart with a No-Bake Biscuit Crust, and a Three Ingredient Toblerone Mousse Filling. Decorated with Cream, and extra Toblerone of course! Start by Greasing and Flouring a 23cm Tart Tin with a loose bottom. I brush over some butter, and add a spoonful of flour, and shake it about till the bottom and sides are covered. In a Food Processor, blitz your biscuits to a fine crumb. Melt your butter, and add it in, and blitz again till combined. Press into the base and sides of the Tart Tin so that its all evenly covered but also firm. Refrigerate for now. 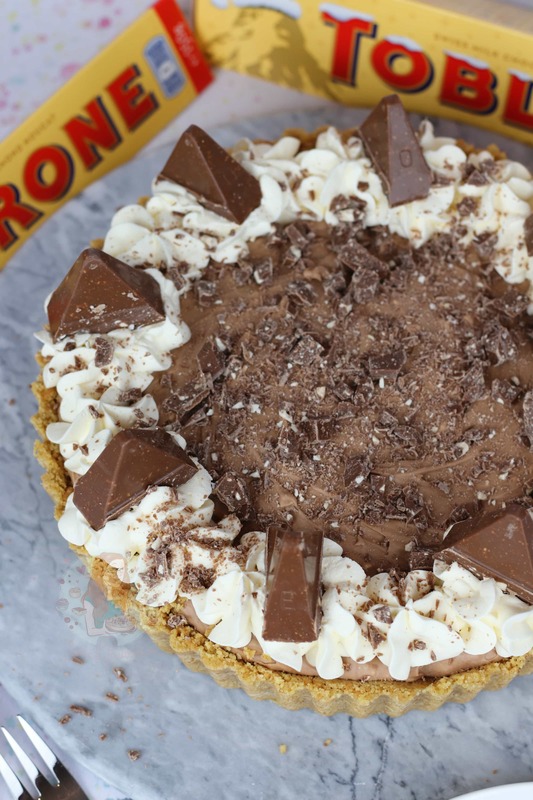 In a heatproof bowl over a pan of simmering water, add your 360g of Toblerone (chopped) and melt slowly, occasionally stirring. Once melted, leave to the side to cool slightly whilst you do the next stage. In a different bowl, add your 300ml Double Cream, and the Icing Sugar, and whip up to soft peaks. I use an electric hand whisk because its easier. 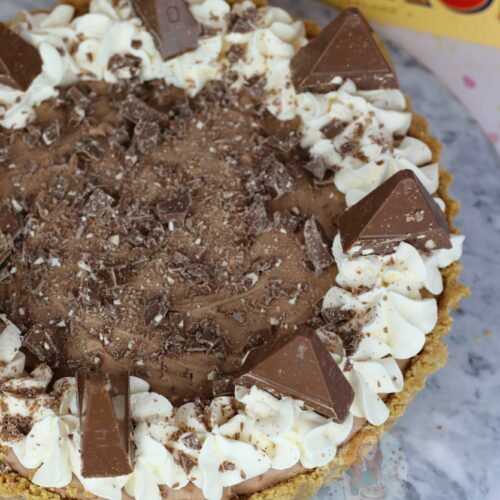 Once whipped up, fold through your melted Toblerone, and then pour onto the Biscuit Base. Spread so its even. Set in the fridge for 4-5 hours, or overnight for a better set. Once set, whip together your 150ml Double Cream and the Icing Sugar, and pipe onto your Tart. 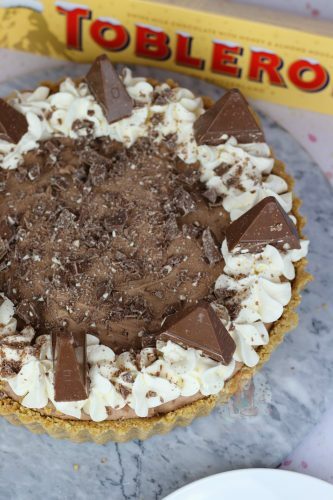 Decorate with some smaller pieces of Toblerone on the Cream swirls, and then some chopped Toblerone pieces. You can use a cake tin for this, or a larger tart tin, but these amount of ingredients perfectly fit a 23cm tart tin, thats about 1.5-2 inches deep. I used one of the 360g (Standard larger bars) of Toblerone for the filling, and then a 150g (standard smaller bar with the funny gaps in it) or Toblerone for the decoration. I use the actual triangles to go on the cream swirls, and the offcuts in the middle is what I chopped up to decorate with. This dessert will last in the fridge for 3 days once set. If your chocolate goes into small solid 'bits' in the tart, its likely cooled slightly too much so has seized. Next time you make it, don't let it cool slightly as much. Older Next post: Lemon & Blueberry Cake! 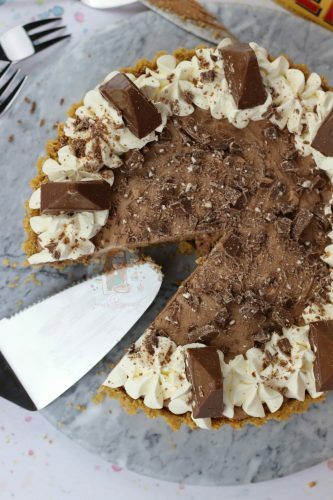 Newer Previous post: No-Bake Mocha Cheesecake! 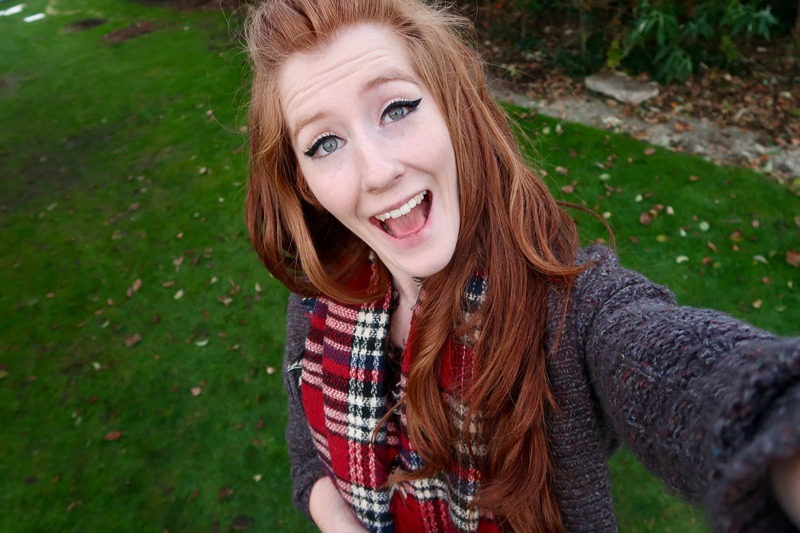 Don’t tell my fiancee I have said this…..but PLEASE MARRY ME! 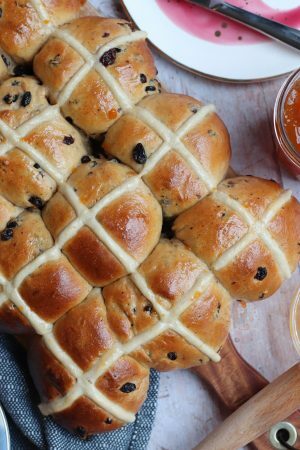 Another amazing recipe that I can’t wait to try!